Delamotte Rosé NV is a blend of 80% Pinot Noir and 20% Chardonnay, sourced in their entirety from grand cru vineyards. Again all the Chardonnay comes from Le Mesnil-sur-Oger. Delamotte is one of only a handful of champagne houses to uphold the traditional ‘macération’ (sometimes called ‘saignée’) method of making rosé champagne, whereby the juice of the grapes remains in contact with the grape skins for a small period of time at the start of fermentation, extracting colour and flavour while contributing to structure. This ancestral technique, painstaking and therefore followed only by the most discerning of champagne houses, yields a champagne of refined structure and subtlety. Most other pink champagnes these days are made by blending a small percentage of red wine into the blend. Delamotte’s delicate fruit and elegant flavours make an excellent apéritif, as well as a fine match for chicken, oriental dishes, and summer fruit desserts. Champagne Delamotte is located in the exalted village of Le-Mesnil-sur-Oger, one of only seventeen Champagne villages to enjoy 100% Grand Cru status, and one of only 6 such villages in the Côte des Blancs region of Champagne. Chardonnay is the only grape variety grown in Le Mesnil, whose grapes are considered by many to be the highest in quality of the entire Côte des Blancs. This is partly due to soil composition in the vineyards, comprising layered sediment and chalk, fundamental to Delamotte’s mineral style, finesse and delicacy. 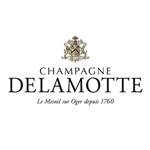 Champagne Delamotte’s style philosophy is based on the small-scale. Quality is achieved by working with small growers and specific vineyards with their own unique terroirs, bringing complexity and character to Delamotte’s champagnes. Growers are long-term partners who understand Delamotte’s quality and style. Fruit is always of the highest quality. Delamotte’s approach requires that vineyard work be carried out by hand. All grapes are picked and then sorted by hand by Delamotte’s experienced staff. A combination of traditional and modern vinification techniques are employed to maximise quality, including the use of gentle Willmes presses. Extended ageing is crucial to the quality and style of Delamotte’s Chardonnay-based champagnes. Established in 1760 in the prestigious village of Le Mesnil, Champagne Delamotte is Chardonnay’s most dedicated advocate. Indeed, most of Delamotte’s vineyards are planted with Chardonnay, all of which enjoy the exalted grand cru status common to the very best Champagnes. Champagne Delamotte's range of Champagnes aims to showcase the unique terroir of Grand Cru-rated village Le Mesnil-sur-Oger. Sister-house of the highly-prized Champagne Salon, Delamotte shares Salon’s pursuit of sophistication and elegance, as well as its focus on the Chardonnay grape. The unremitting quality of Delamotte’s champagnes is due in part to its small-scale approach, limiting quantity to just 50,000 cases per year. The Champagne Delamotte range comprises four champagnes: Delamotte Brut NV (Non-Vintage), Delamotte Blanc de Blancs NV, Delamotte Blanc de Blancs Vintage (currently 2007) and Delamotte Rosé NV.